Rising from the Brooklyn underground, Dynasty Electric’s explosive live shows and unique blend of electro pop and psychedelic punk rock has earned the group critical praise and attention from around the globe. Fronted by the powerful and seductive vocals of Jenny Electrik, while Dynasty Electric’s retro-futuristic pop sound is crafted by Seth Misterka. blends yesterday’s roots with the innovative urban beats of today. His accomplishments during his gradual evolution from Hip Hop DJ to World Music Taste Maker have made him one of the top DJs & producers in LA’s eclectic music scene. When he isn’t in the studio producing, spinning at an underground Hip Hop club or jamming with local artists, you might find him on a yoga mat. Avasa & Matty Love were married in 2010 on the land where Matty grew up: Love Field. Two weeks later, they released their first EP, Love is King, Love is Queen. As husband and wife, their joy and purpose is to serve the world through music, cultivating peace, and uplifting hearts and souls. Their music is an inspiring blend of conscious world pop and devotional soul. For a good time, sit next to the beat-happy, Krishna-crazed love magnet, MC Yogi as he works his creative magic up in his Northern California studio, Photoshopping all kinds of dazzling personal India travel photos into wild collage art that will serve as backdrop for his “cosmic, electrifying” new shows with one hand, while simultaneously blasting his new single, Forward. or Durga Das, as he is also known, is a kirtan chant artist, sacred singer songwriter and a practitioner and educator of Bhakti Yoga – the yoga of love. David travles extensively sharing kirtan, devotional music and the spiritual meditative and musical aspects of yoga. David’s music embodies are devotional mysticism, distinctive musicality, poetic intimacy and a joyus, often ecstatic quality. 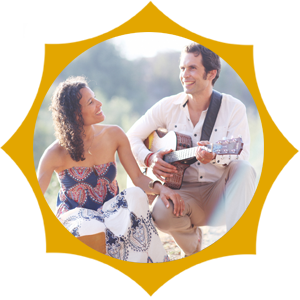 Scott and Shanti are a dynamic husband-wife duo from Boulder, CO sharing their love and devotion to uplift humanity through their ecstatic music events and inspiring immersions. Their latest double-CD release SoMAntra® has over 150 minutes of ecstatic chants, sacred sound meditations, mudras, and embodied practices empowering innate mind/body wisdom. 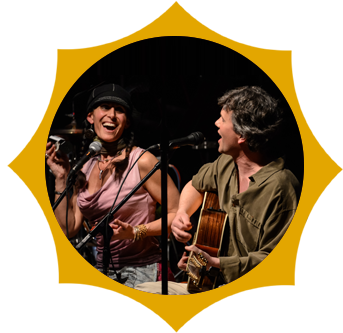 Their unique renditions of original chants from wisdom-traditions around the globe take you on a journey into the current moment of abiding self-realization. From the time he could hold a crayon, Jon Marro was drawing. So it was established at an early age that he simply loved to create. And he still does. In fact, Jon is determined to spend his life as a Solar Artist in service. Recently, Jon has mindfully designed for many well-known companies including: Tom’s Shoes, PACT Underwear and Cafe Gratitude. The Director, Photographer, and Tribal Body Artist (inspired by his local Venice Tribe) has lifted the barriers of religion, race, and age as he attempts to capture and convey the ecstasy and pain that unite us all. His photography has taken him on extraordinary assignments to distant corners of the world, exploring the full range of human expression, the youth and movement. Amanda Giacomini is a fine artist, award winning children’s book illustrator and international yoga teacher. She has been featured in Yoga International, ORIGIN Magazine, and on the cover of Yoga Journal. When she is not at home teaching at her studio in Point Reyes, she travels the world offering yoga at conferences, festivals, schools, nightclubs, museums, and event the White House. In 2010, Amanda became a faith ambassador for Michelle Obama’s Let’s Move. Together with her husband, MC Yogi, they founded The Yogi Revolution, an initiative to bring yoga, music and art to underserved communities. Ashley is an innovator in personal development bridging yoga, psychology and neuroscience. She is an acclaimed yoga–meditation instructor, registered Marriage + Family Psychotherapy Intern, writer and Ordained Priestess. DETAILS magazine recently named Ashley Turner “1 of the Top 6 Trainers to watch in 2014” and Dr. Oz’s ShareCare.com calls her “the #2 Online Influencer for Stress Relief”.